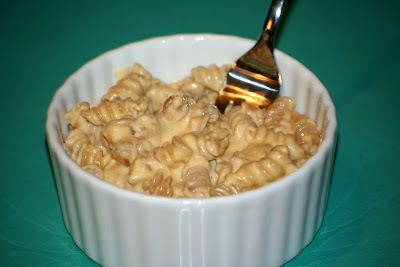 I believe my search is over the perfectly creamy and cheesy stove top macaroni and cheese. One night when planning to make Mac & Cheese to go with some chicken tenders from the freezer for a quick meal, I was actually looking through my Joy of Cooking cookbook while waiting for the oven to heat and the water to boil. I decided to just glance and see what kind of stove top mac & cheese recipe they had and I knew immediately that I needed to try it. I had all of the ingredients on hand, including the evaporated milk, which I actually needed to use relatively soon. For a good, classic stove top mac & cheese you can't go wrong with this recipe. This recipe can be adapted really well too, with some different cheeses based on what you have and what you prefer. One day I may try it with White Cheddar to see how similar it is to my favorite Panera Mac & Cheese. I've tried replicating, and have come REALLY close, but this may be better when adapted! Cook pasta in large pot of boiling water per directions on package. Drain and return to the pot. Return the pot to low heat, add butter and mix until butter is melted and coating the pasta. Add the rest of the ingredients and mix well. Because everything is added at once I recommend having everything prepped. Continually stir until the sauce is smooth and thickened, about 5-10 minutes. If after 5 minutes the sauce hasn't started to thicken increase burner to medium heat. Pay careful attention not to let the sauce curdle.